Change out the Electrical Outlets and Switches – This. And this. Our outlets and switches were yellow and grimy and scary and HAD to go. Talk about a beautiful, wonderful, glorious improvement. Just be sure to shut the power off at the breaker first. Upgrade Your Door Knobs – This was a super simple install. YouTube has some great demos on how to change them out quickly. And if I could do it, so can you. Upgrade Your Doors – My husband works from home and his office is situated directly next to our son’s playroom. Yikes. Not much we can do about sound passing through the walls, but replacing the thin, hollow doors definitely helped block some of it. Additionally, we took advantage of our laundry room window by replacing a regular door with one that has windows which brightened up an otherwise dark hallway. The difference is astounding. Replace Kitchen and Bathroom Cabinet Hardware – No brainer, all you need is a screwdriver really…but a drill is really your best friend for a quick fix. Change Out Light Bulbs – Might sound silly, but lighting is the best way to showcase what you’ve got and can really make or break the ambiance and functionality of a room. In areas such as the kitchen where you want your latest dish to really pop, or your walk-in closet where you should be able to see everything and make a quick wardrobe decision for the day, it can make a huge difference. And for an added bonus of long-term energy cost savings, splurge for the LEDs. Install New Bathroom and Kitchen Faucets – For form and function, this is a great investment. Just think about how many times your faucets get used each and every day! The effort for us was sooo worth it! Replace Outdated Light Fixtures – Am I the only one who is not a fan of ceiling fans? The ironic thing is that my one year old is IN LOVE with them. Basically every time we are in a hardware store we have to take him down the fan aisle. And this house had a ceiling fan in every. single. room. Replacing these with more streamlined, contemporary style fixtures made all the difference. Paint Walls – I’m all for expressing yourself, but giant red walls weren’t exactly the statement I was going for this time around. We quickly covered them with Kelly Moore, San Fransisco Fog (KM5822) for an updated look. Replace Old Window and Door Screens – There’s nothing more annoying than to have a beautiful view of the great outdoors be blocked by an eyesore of a screen patch – or worse – a hole. Before heading to the store, measure inside the frame, taking left, right and middle measurements of the length, and top, bottom, and middle measurements of the width. The final measurement you should keep are the largest width and length that you measured. Replace Old Vanity Mirrors – I am loving this and this right now, but the possibilities are endless! I hope this quick list has been a help. Have you tackled any of these projects yourself? How did it go? 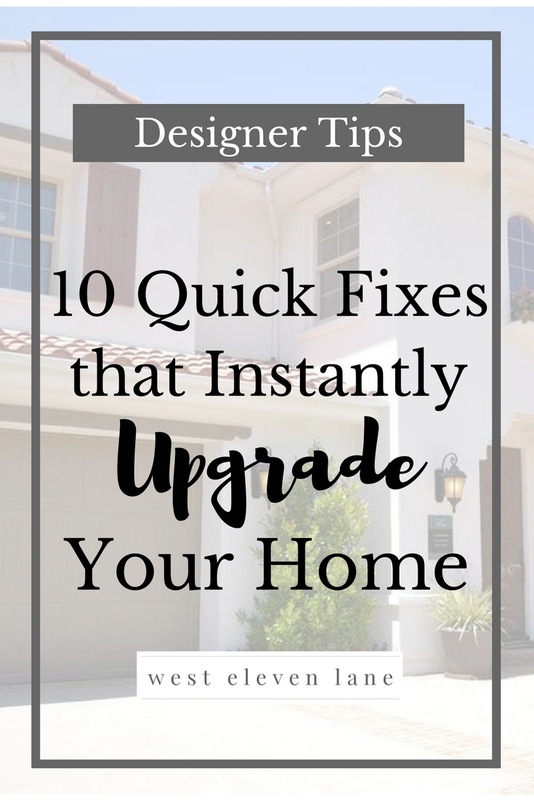 I would love to hear more quick fix ideas, so please feel free to share below!